One of the challenges for preparing an Easter meal is coming up with something tasty that can feed your entire family. At the same time, you don’t want to be slaving in the kitchen all day when there are important Easter traditions to attend. 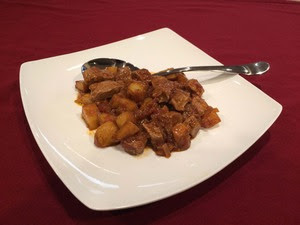 Kontos Foods, maker of artisan flatbreads and other ethnic foods, has a solution for you: Kokkinisto (which means cooked in red tomato sauce) is a classic Greek stew made from veal or lamb. Onions are caramelized, and the veal or lamb is browned before being simmered in a garlic tomato sauce. Finally, chopped potatoes are added and cooked till the sauce is thickened. Serve with Kontos Pocket-less Pita to soak up the delicious sauce. 1. In a large pot add ½ cup of olive oil. When hot, add the Bay leaf and onions, sauté the onions (until caramelized). 2. Stir in the veal or lamb chunks, and brown on all sides. 3. Remove the meat and set aside, and deglaze the pot with the wine, and allow to the wine to reduce. 4. Dilute the tomato paste in the water, and add to the hot pot, along with the tomatoes, garlic, and cinnamon stick. 5. Stir in the reserved meat, and simmer for 30 minutes. 6. In a sauté pan, add the other ½ cup of olive oil, and sauté the potatoes for 3-4 minutes. 7. Add the potatoes to the large pot. Stir and simmer for an additional 30 minutes, until the Meat and Potatoes are tender and the sauce has thickened. Salt and Pepper to taste. 8. Note: if the sauce is too thick, you may add some boiling water to thin it. Kontos sells its products to retailers and foodservice establishments across North America and several other countries. Find Kontos on Facebook and follow the company on Twitter @KontosFoods.